as I work the soft, moist soil with my fingers. A pair of bluebirds sits on top of the garden fence, singing to each other. The air is cool, but the sun warms my body through my sweater. Yesterday afternoon truly felt like spring! After months of rest, the soil is thawed and coming to life. 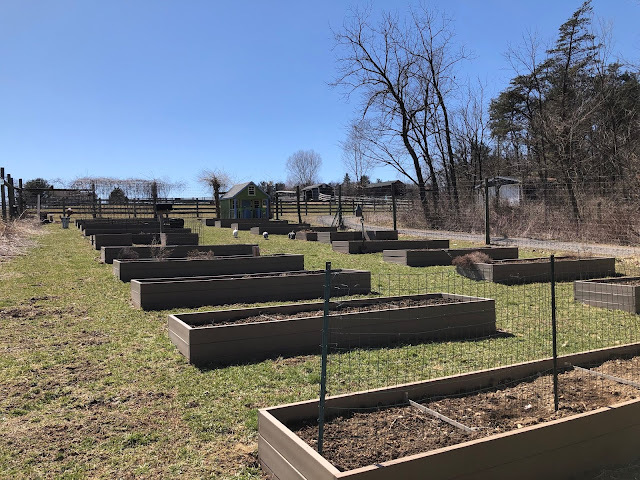 I finished all of the clean-up chores... readying the raised beds for planting. I weeded and cleaned up the asparagus bed. from the rich, dark soil. Don't be fooled by what looks like boxes full of dirt. and then there are billions of microscopic organisms coming back to life. It's nothing short of miraculous... what happens in the soil. After clean-up, I planted organic sugar peas, scallions, yellow onions, radishes and beets. As the weeks pass, more and more seeds and seedlings will go into the ground. Oh, how I long for meals picked fresh from the garden!